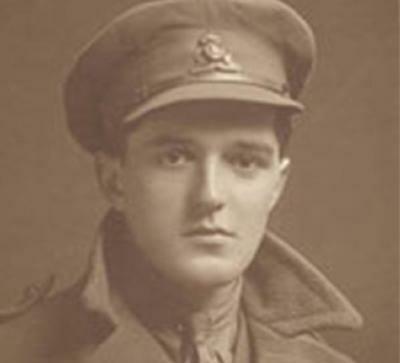 The experiences of a young soldier killed in the First World War underpin a major new work by the world-renowned composer and University of Southampton professor, Michael Finnissy. Remembrance Day draws on the poetry and prose of Henry Lamont Simpson, whose work was published posthumously. He was an officer in the Lancashire Fusiliers, and was injured in Belgium in 1917. Henry was brought back to Southampton and then treated at a military hospital in Hursley Park near Winchester.1 Returning to The Front in 1918, he was killed by a sniper while reconnoitring No Man’s Land. He was just 21 years old. Michael Finnissy’s piece receives its world premiere at the University’s concert venue Turner Sims on 16 November 2014 (730pm), performed by the University’s Hartley Singers and Sinfonia, along with members of two renowned new music groups, the London Sinfonietta and Exaudi. This three-way collaboration is unprecedented. Finnissy himself will play the solo piano part, and Southampton composition lecturer Benjamin Oliver will conduct. Henry Lamont Simpson’s great nephew, a Southampton alumnus, will be in the audience as a special guest. Professor Michael Finnissy comments: “It is fitting that young people are integral to the performance. The student musicians are much the same age as Henry when he was sent to fight in the war and this premiere gives them the chance to reflect on the horrors faced by young soldiers a century ago. Remembrance Day sets Henry Lamont Simpson’s poetry to music for solo baritone, juxtaposed with choral commentary on the themes of war and remembrance. In Part I, the choir sing about Mankind’s thirst for trouble and war, with text from the Prologue to Goethe’s drama Faust; in Part II, they sing even older texts, about martyrdom, by the medieval poet Peter Abelard. The piece frequently references the music of the 1910s and draws on research of Southampton postgraduate musicology students. The world premiere forms part of a weekend of activities, including composition workshops, round-table discussions and a free pre-performance talk by the poet John Birtwhistle, who will explore the life and poetry of Henry Lamont Simpson. The concert event is one of a series being held by the University of Southampton to mark the centenary of the start of the First World War. The performance concludes a week of music commemorating the war and is part of Turner Sims 40th anniversary season. Music at Southampton is grateful to Arts Council England for an award under the Grants for the Arts scheme, which has supported the first performance of Remembrance Day and associated events throughout the premiere weekend. Ticket information can be found on the Turner Sims website. The University of Southampton is holding a series of events and activities throughout 2014 / 15 to mark and reflect upon the First World War. The University aims to examine aspects of the war, beyond those which are typically explored. Our rich programme of events draws on the expertise of many University departments, such as; historians, musicians, linguists, cinema scholars and archivists.